Smokey would be a total cuddle bug with his little pony boyfriend, getting all purry and blushey feeding off Peeb's love and all his beautifully honest feelings....And being lowkey possessive, towering behind Peebs smiling oh-so-sweetly when ponies attempt to flirt with the little pony. He shrugs innocently when Peebs is confused why they all flee. I imagine the friendship would be a healthy way for them both to move on from their respective one-sided loves eventually. I can see Peebs not judging Smokey for his feelings toward his aunt, just smiling sadly and admitting that he still holds a flame for Pandora, even now as she is happy in his sister's arms. Who is he to judge when it comes to love? They eventually get to a place where love grows between them, and poor Peebs has to try and handle the intense changeling/dragon courting rituals as his crush determinedly pursues him. And maybe Smokey just loves seeing that delicious blush on his friend's face when the hybrid is not at all subtle about flexing his muscles in front of him. Enjoy my content? Consider supporting me on Patreon! It has rewards, sneak peeks, and early viewing of finished art for patrons! Also, for each funding goal met, I produce a new promised art and story reward! I just absolutely LOVE your character designs!!! girl, this drawing has the words "SHIP" all over it! I didn't know anybody was interested in that as an option! I'll consider offering these "chibis" in my price guide. I friggin love Zee, her hair is curly and poofy like mine! Also she's amazing! With that tail it looks like if smokescreen sat in the fetal position and rolled his tail up over his head he could be a bowling ball . Like amythest and Jaspers roly thingy attack. I don't know if this has been said already but if it has, oh well. If not, then here. 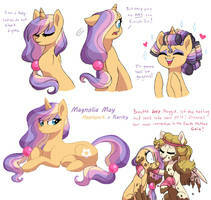 The ship name for Rosemary and Magnolia May should be Flower Power. 'Nuff said. Great job on these btw! They're all super adorable! O shoot, it's been such a long dang time since I've last looked at that piece. I was like "Wait, where did I hear of this ship name before hmmm... ah, I'll just let someone else remind me" and boom, here we are. Oh well! Anyways, you're very, very welcome, Miss Lop! Ohhhh, YES!!! I love how cute these are. Are you planning to do all of your other characters in the future like these? Awe, they’re all so cute! Has Smokescreen always been....Gecko like or it this new? Haven't seen Jam and Artemis for awhile!!! All of these pairs are so darn adorable. OMG SO ADORABLE IM DYING!!!!!! aw YISS moondancer/zee!! always great to see those two cuties, especially during a moment of sincere appreciation. Aw, Smokey and Peebs! Can we have more of that, please? But do you think you might make these into commissions? Cloudburst/Zipperflash is my favorite because it makes me laugh. The "Who ARE You!?!!!???" response is just gold. I like the idea that Cloudburst always manages to pop up just a second after Zipsy has truly forgotten about her. Just a second of peace before she " "s back into his life. I look forward to the reveal of Cloudburst being Stormy's sister because Zips has the best reactions.